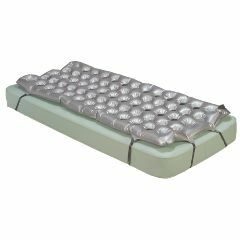 The Air Mattress Overlay by Drive Medical is designed to reduce pressure and prevent bed sores from occurring. The Air Mattress Overlay is constructed of heavy-duty gauge vinyl to provide maximum assurance that no leaks occur. The Air Mattress Overlay is very easy to clean, and stays attached to the bed with 4 adjustable straps. This product also features an emergency air release valve to deflate quickly and safely. Unique construction allows for efficient air flow throughout mattress for use in the treatment and prevention of pressure sores. Air flow holes reduce heat and fluid build up. Adjustable bed straps prevent mattress from moving. Emergency air release valve deflates mattress quickly and safely. Easy to clean with mild detergent. Two adapters for easy filling and air removal. Mattress Dimensions: 72" x 35" x 2.5". 90 Day Limited Warranty on seams and valve. Important Notes: The Air Mattress Overlay does not include an air pump and is sold separately. Click here to purchase the Air Mattress Overlay Pump. I really do not know. After filling it up the first time the air level dropped. I then went ahead several days later and just added a little bit of air to make it a little firmer. The next morning it was right back to the level it had dropped. It is still doing the job and has not lost any more air. Hope this helps. I've had it for a short time. I had filled it and after a couple of days the level of air was reduced, so I added a little more air and the next day it went back to the level it was at. It is still doing the job, so I don't really know if it has a built in regular or some thing to that effect. I have not added any more air since and the level has stayed the same for the last 3 weeks. Hope this helps.